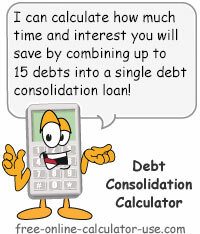 Consolidate Debt Calculator: Will Consolidating Save You Money? Consolidate Debt Calculator: Will Consolidating Really Save You Money? This calculator will calculate the net effects of paying off all of your debts by taking out a debt consolidation loan. Contrary to what lenders may tell you, just because your monthly payment might be smaller, does NOT mean you will actually save money. Results include a side-by-side comparison of the payment amount, number of months, and interest cost -- with and without consolidating. The Aware tab includes the lesser known cons of consolidating your debts. Note that depending on the width of the calculator, you will see either a vertical entry form optimized for mobile devices (narrow widths) or a horizontal entry form optimized for desktop devices (widths wide enough to accommodate rows and columns of entry fields). To add a debt, enter the name, balance, interest rate, and payment amount. When you're satisfied with the entries, tap the &plus; button (may also appear as "Add" or "Add Debt" depending on the width of your device). To edit a debt in the list, tap the radio button in the Edit column. This will load the debt into the form for editing. When you're satisfied with the changes you've made, tap the S button (may also appear as "Save" or "Save Changes" depending on the width of your device). To delete a debt from the list, tap the radio button in the Edit column. This will load the debt into the form for deleting. Tap the − button (may also appear as "Delete" depending on the width of your device). To add a debt to your consolidation plan, click the Add Debt Row button. Then complete the row of entries for the debt you are adding. To remove a debt from your consolidation plan, click the X button in the left-hand column of the row you wish to remove. Enter the name of the creditor as you want it to appear on the printed report. Enter the monthly payment for the debt, without the dollar sign or commas. If you are including your mortgage in the debt consolidation loan, be sure to only enter the principal and interest portion of your mortgage payment (leave out the portion for taxes and insurance). Based on your principal, interest rate and payment amount entries, this is how much interest you will pay on this debt between now and when you make the final payment. If the field displays an ERROR, it means that at the terms you entered the debt will never be paid off. Therefore, in order to enter the debt you will need to increase the payment amount until the error goes away. Based on your principal, interest rate and payment amount entries, this column calculates the number of monthly payments remaining on the debt. If the field displays an ERROR, it means that at the terms you entered the debt will never be paid off. Therefore, in order to enter the debt you will need to increase the payment amount until the error goes away. After entering all of your debts, enter the consolidation loan terms into this section, and then click the "Calculate Consolidation" button. Enter the annual interest rate of the debt consolidation loan. Enter as a percentage without the percent sign (for .06 or 6%, enter 6). Enter the term of the debt consolidation loan in number of years. Enter any fees or costs associated to the debt consolidation loan (closing costs, origination fees, etc.). Enter as a dollar amount, but without the dollar sign and any commas. Total of monthly payments Without consolidation and With consolidation. A plus (+) sign in the Diff +/- column indicates the consolidation loan payment is greater than the total of your current payments. A minus (-) sign indicates the consolidation loan payment is less than the total of your current payments. The number of months until debts are paid off Without consolidation and With consolidation. A plus (+) sign in the Diff +/- column indicates the consolidation payoff term is greater than the current payoff term. A minus (-) sign indicates the consolidation payoff term is less than the current payoff term. Total of cost (interest and loan fees) Without consolidation and With consolidation. A plus (+) sign in the Diff +/- column indicates the consolidation loan will cost you more than your current payoff interest charges. A minus (-) sign indicates the consolidation loan will cost you less than your current payoff interest charges. This calculator will calculate the loan consolidation consequences of combining all of your debts into a single loan payment. The calculated results include a side-by-side chart comparing the payment amount, number of payments, and loan costs with and without the consolidation. Finally, the calculator also includes a bar graph to give you a visual reference as to the cost difference. But before you use the calculator, please make sure you are aware of the lesser known debt consolidation pros and cons by visiting the Aware tab. For each debt you would like included in your debt consolidation loan, enter the name, current balance, interest rate, and monthly payment, and then click the "+" button (may appear as "Add" or "Add Debt", depending on the width of your device). For each debt you would like included in your debt consolidation loan, click the "Add Debt Row" button and enter the name, current balance, interest rate, and monthly payment. Once you have all of your debts entered, enter the interest rate, number of years, and any fees associated to the debt consolidation loan. Click the "Calculate Consolidation" button. This will populate the "Comparison Results" chart, generate a button for creating a printer friendly report, and display a bar graph comparing the loan costs with and without consolidation. The pros and cons of debt consolidation. Con #1: If you've ever used a debt consolidation calculator on a lender's website, and the results described a payment decrease as a "savings," then the "Con" you need to be most aware of is ... the lender! Look, just because combining your debts into a single loan will result in a lower payment, DOES NOT mean you will actually experience a "savings." Because if the interest rate is higher and/or the repayment term is longer, you will likely end up paying more in interest charges than if you didn't combine your debts into a single loan. You see, it's the total cost (loan fees and interest charges) of the consolidation loan that determines if you will actually save any money, NOT the payment amount. Con #2: Another potential drawback to consolidating your debts, is that most people I know who have consolidated their debts have done so using a home equity loan (HELOC). Well, nothing ... unless it bothers you that you are probably converting mostly non-secured debts into a secured debt. If you fall behind in your payments on a non-secured debt, about the worst that can happen is that you might get harassed by a bill collector. However, if you fall behind on your mortgage payment you could end up living in a homeless shelter. If that doesn't bother you, then the home equity loan will probably offer the lowest interest rate for your consolidation loan. Con #3: A third potential drawback to consolidating your debts, is that it lessens the pain of having lived beyond your means. And without that constant painful reminder of the mistakes you've made in the past, you may not have learned a severe enough lesson to keep you from getting into trouble again. Sorry, but I defer to your lender ... because frankly, they have likely covered every conceivable benefit -- and then some. Personally, I always vote for paying off each debt separately, one painful-reminding payment at a time. If you want to actually "save" money while paying off your debts, I suggest using the rollover method instead (Rapid Debt Reduction Calculator).